May 22, 2014: Andranik in the deleted prologue of my new novel "The Ash Tree"
May 22, 2014: Here is the cancelled prologue to my new novel about the Armenian-American family of Armen Ararat and his wife, Artemis – from the time of the Armenian Genocide in 1915 to 1972. 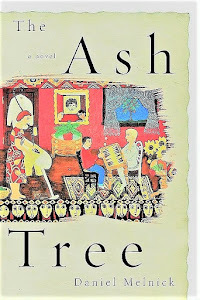 The novel’s title is “The Ash Tree,” and it will be published April 24, 2015, on the hundredth anniversary of the begining of the Armenian Genocide; a description of the novel is to be found at www.theashtree.net . I have been pummeled, shot at, imprisoned, and sometimes now I can hardly breathe. I am fifty-nine, and my time is coming to an end, sooner rather than later. There remain, of course, moments of life for me. After the Great War, I met an intelligent woman by the name of Nevart, and two years ago I married her – in Paris, lyrical bittersweet Paris, almost forty years to the day after my first wife died in Anatolia. Paris is bittersweet because it is the site of our defeat five years ago – in 1919, when Wilson’s so-called Peace Conference gave us no promise of a homeland and no justice for the Ottoman massacre of our people. Naturally, we were not alone in being betrayed at Versailles. Yet we Armenians still idealize Paris, as much as do the Slavs. And we love the French language, the language of Racine and Rousseau, of Baudelaire and Verlaine – beloved by our great poets Siamanto and Varoujan, whose works are filled with echoes of them. In 1915, both men were murdered by the Turks. So a breath of time ago I was married in bitter beautiful Paris. Soon we moved to California to aid my asthma, and I walk now beneath Fresno’s summer sun. Its fury beats down on me, through to the bone. I call it my constitutional, trudging about my backyard. A grey-green eucalyptus towers over one side of the yard, and a Fresno ash tree with its blood-red blossoms borders the other. Beyond the yard, I look out at parched, wind-blown fields, which stretch to the Sierras. The earth here is as hard as iron and dry as the moon. But when worked by spade and shovel, it can be planted with vines, which once irrigated yield tasty grapes. Many Armenian farmers make the attempt, pitting their knowledge and scant cash against the heat. My Fresno yard, though, remains hardpan. What energy I have, I devote to my wife and to my writing. In the shade by the side of our house we do, however, grow our purple basil, parsley, and mint, bushy and aromatic in terracotta pots. We can’t help it. The mornings I spend at my desk writing these words or sometimes in my basement workshop, where I build chairs and tables, for as a boy I was an apprentice to my father, a carpenter. I remember admiring the wonderful form of his tables, the perfect lines of their slender legs, the elegance of his carving, and also the clarity of his instructions. From the age of twelve to eighteen I worked toward whatever mastery I could achieve in his workshop. When I was seventeen, I met a short, tender village girl, and I courted her with some dedication. We married in April of 1882. Soon our son grew within my wife. When the time arrived in all its wonder, she died giving birth. Two days later the infant also died. Yes, a carpenter. My chairs are like my father’s, lithe and simple. A few weeks after my little loved ones died, my father walked into our kitchen, his head bloodied and his eyes blackened. A Turk had taken offense for no reason, in the way racists do. For a long week, I silently watched and memorized the perpetrator’s habits, his haunts, his walks. One evening, I followed him through a barren field and called out that I was the son of Ozanian. I beat the Turk to death. Soon after, I walked away from our village. Walking has been my destined mode of transportation. Even in childhood, we would walk the hours west from our Sivas village to Ozan, our ancestral home. When at eighteen I walked away from our village, for weeks I walked west hundreds of miles, finally reaching Constantinople. It was in 1883, and I joined the Armenian national liberation movement. After a decade, I found myself in Kars, where I was imprisoned for being a proud man and an Armenian. I am among those who have witnessed atrocious murder, and I have also been one who is willing to return blow for blow. When the Turkish prison guard assigned me clean-up, I swept with the stiff-bristled broom and suddenly turned to thrust it in his face. Blinded, he was unable to fend off my blows or prevent my escape. I walked two hundred miles from Kars to Sassun in order to join the Armenian General Serob; neither of us felt we had any choice but to defend the Armenians of Anatolia from Sultan Abdul Hamid’s slaughter of our people. And when Turks assassinated Serob in 1899, I searched the region with my men and tracked down the assassin, General Khalil, whose throat I slit. Two years later, on foot, we snuck into the Armenian Holy Apostolic Monastery in the Turkish-occupied city of Mush. We were only a few score of men, but we held the Monastery for nineteen days, and we involved the European Consuls in our negotiations. That was our mission: to broadcast to the Europeans the tragic fate of the Armenians under Ottoman rule. On the last night, we dressed in captured Turkish uniforms and escaped through a secret door. I was first out. I was dressed in an officer’s uniform and walked calmly through the Turks’ lines, addressing soldiers in formal Turkish. Little did they know I was not one of their officers but their enemy Andranik Ozanian. This California valley reminds me of Anatolia. The starkly out-jutting Sierra Mountains, the stretches of tinder-dry brown earth, the interruptions of irrigated green, and the small towns like villages – it brings back our homeland. Anatolia, with its ancient Armenian farms and villages, is a similar patchwork of irrigated vines and blank dirt, of outcropping hills and hardened plains with a looming horizon of mountains. I would tramp across those plains with my men, whether in an army of thousands or a score of partisans, all of them ready to fight with courage and intelligence to defend our people. Never will I forget the years of fighting side by side with them. Life would be worthless to me if I had not pit myself in that way against fate and death. Struggling to save Armenian lives in 1915, I led my army against the Turks, who were driving us from our lands and murdered 1.5 million of us. Using all our cunning and desperation, we freed Van from the Turkish siege in 1915, and in 1916 we fought against them in Bitlis. In 1918, I was made governor of all the Armenian cities of west of the Arax River, and we helped hundreds of thousands of Armenians to escape to the east as again the Turks attacked and sought to obliterate us. In those years, the political leaders of Armenia on both the right and left capitulated to the Young Turks and then to the Ataturk regime. Finally, they agreed to the worthless Batum Treaty, which created a shrunken Armenian nation. My army and I held out to the southeast in Zangezur until the end of 1918, but then bitter winter descended. I first came to the United States in 1919. Wilson’s government would not see me or any other official from Armenia. Even now, if only America helped, the little we need is not too much to ask, and we could then raise a sufficient army to defend our now tiny nation. Across America, I have spoken to filled auditoriums in Boston, in New York, in Detroit and Chicago, and as far west as San Francisco, Los Angeles, and Fresno. To Armenians and non-Armenians alike, I described how the Turks had expelled our people from Anatolia, how since 1896 they had murdered two million of us; over these years entire lost provinces of our homeland have been wiped out, and the legions of the disappeared call out to us: Do not believe the deceptions of the Turks; they will honor no treaty. We must protect our vulnerable people. By early 1920, I raised half a million dollars for our refugees. For the sake of my lungs, I have now returned to California. In the afternoon, I walk the few blocks to our downtown Armenian café called the Asparez Club, where I sit by the window and quietly sip black coffee. Around me, Armenians gossip and play cards. These men fled from Turkey’s machine of death and now are mere shadows of themselves, provincial imitations of the Armenian life in Constantinople, Harput, Van, and Yerevan. Of course, there is Lulegian the publisher of our little newspaper and the gifted actor Zarafian, but it is as if they all pretend, as if they are acting rather than living, and then there are the boasting farmers and packing-house bosses, who worship the American god of money and whose loud voices fill the club. In this city named Fresno, the ash tree, these self-important men, leaders only by virtue of their wealth, come to my table to pay homage while I quietly sit and read Lulegian’s rag of a newspaper. Maybe the young will rise from these ruins to save us. There is big Aram Saroyan, who at twenty years old is studying in law school; he’s a genuinely Armenian character, yet American too. There is also little Armen Ararat, twenty-four, both a farmer and a poet. He speaks such literate Armenian, it is as if we are talking together in the shadow of the Galata Tower in Constantinople, two witnesses to the disaster. But these young men are weak, tender shoots struggling to survive in the blasting heat of the intolerable Valley. They too pretend, act rather than live, though my heart is touched by their struggle in this place of no culture, no history, no hope. A few of my fellow soldiers have also found their way to this city of dust and ashes. On some Sundays, I visit with Colonel Dikran Haroutian, who helped to defend Harput. His wife’s cooking transports me back to vanished Anatolia, and there is his daughter Artemis, who is so pale yet so sharp as she assesses me with her big Renaissance eyes. In a better time and place, she could well become a colonel herself. The Prime Minister of Turkey, who is head of the ruling Islamic party, has recently expressed his commiseration with the Armenian grandchildren of the survivors of the 1915 “massacres” – which he does not call a genocide. What is bad news and what is good here? The bad news is of course that the long-time ruler of Turkey will not use the term genocide, though he does speak of a million and more dead; the word genocide carries a political weight which is too great for him to bear at least this year. The good news is that the long-time ruler of Turkey has directly addressed the great loss of Armenian lives in 1915 when Turkey was under Ottoman rule, and this means that next year’s centennial of these deaths may well provide the occasion for added recognition and rapprochement. The burden borne by the grandchildren of genocide survivors haunts all Armenians, even the most complacent, and it provides the theme of much Armenian literature over these one hundred years. It is particularly appropriate then, though unfortunately still too tentative, for Erdogan to address himself to those now fully mature Armenian grandchildren. Their significant burden has seldom been noted by Turkish authorities. It is this burden carried by the children and particularly by the grandchildren of the genocide which has loomed large in my own thought and imagination. It has led me to write a novel I’ve just completed, “The Ash Tree.” The book is partly a fictionalized version of the story of my wife’s family, for her father – Aram Arax – was a witness in Istanbul in 1915, and his memories form a crucial inheritance for Jeanette and her brothers. That story has been explored in her nephew Mark’s memoir, in other fiction, and in essays; what I’ve tried to do is to tell it particularly from the point of view of the women in the story. The mother and the daughter are two passionate and lively women, who experience in equal measure the tragedy and the comedy of this story. I’ll try to describe more of "The Ash Tree" in future posts; I’ve been away from this blog due to illness, but am returning.